During a cross-country trip from Washington to Indiana—I had a strange experience at a Civil War battlefield. I have always been interested in the way—but I never had the chance to visit the battlefields before. It was a balmy, warm day and I was looking forward to walking across the battlefield and learning about the battle. We pulled over at the side of the road and started to walk towards the beginning of the battle route. It was a very bright day and there were other people around enjoying it. I didn’t feel in anyway strange. As we climbed a large embankment though I could hear talking. I put it down to other tourists. When we got to the top there were two men in full uniform talking to each other. I figured they were reenactors. 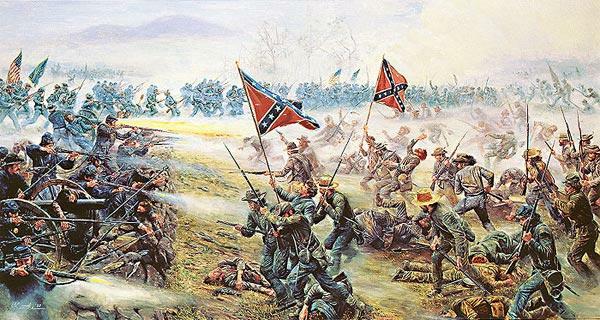 There’s nothing strange about grown men in uniforms pretending to be Civil War soldiers. Later we saw two riders on horseback, and we saw a bunch of other reenactors marching back towards the top of the hill. We have a great time and I learned about the battle. My wife and children and I finally reached the visitor site and I asked the lady there about the reenactors. She looked puzzled. It wasn’t kids… So what else could it have been? I believe we saw Civil War soldiers up close and personal. They didn’t see us… so were we ghosts in their timeline? Did my family and I slip back in time to the war?